Click on an area on the map to learn more about that location. Back on the path and past a sculpted hill-side is a woodland that is the most collection-oriented garden at Chanticleer. 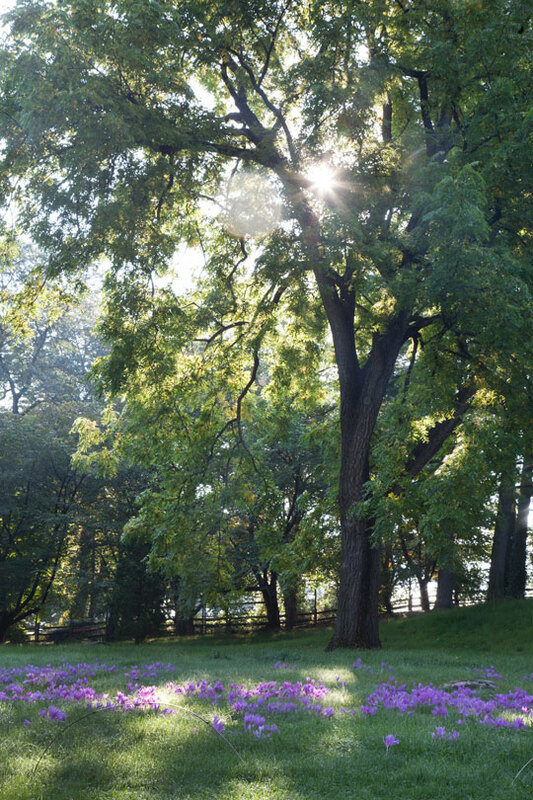 Originally a poor area full of poison ivy and honeysuckle, it was cleared in 1994 and planting began the next year. While most of the plants in this garden are native to Korea, Japan, and China, the design style is of an American woodland garden. Ground gingers such as the marble-leaved Asarum splendens are colonizing in association with a pretty pink primula.Poking through the many ferns are Asian jack-in-the-pulpits such as Arisaema sikokianum with a brown and white striped hood. 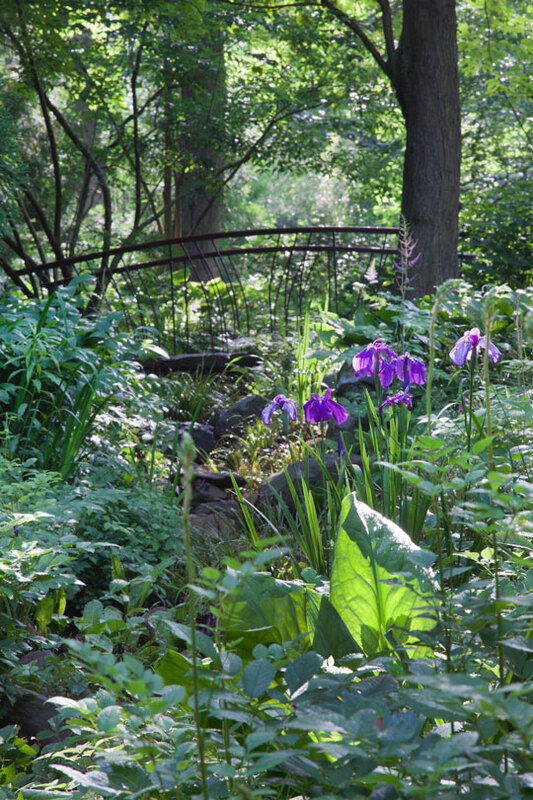 Despite being a collection, this dense and complex garden has a rich atmosphere of woodland magic. Bell's Run is a quiet respite from the jazziness of the garden. 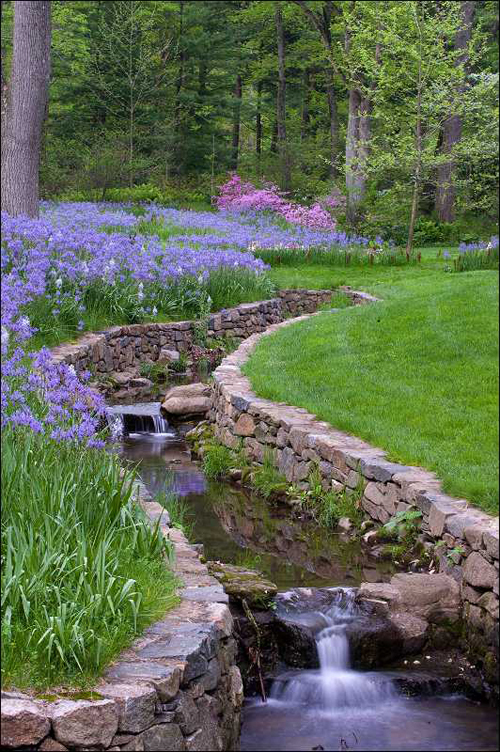 Weedy trees were removed to give a clear view, and the undulating lawn is planted with hundreds of blue-flowered quamash (Camassia) that bloom in the spring. The waterwheel was installed in the 1940s to pump water from the stream to the swimming pool behind the main house. While no longer serving that purpose, we are exploring ways to get it working again. It remains a wonderful piece of industry in a romantic setting. Bell's Woodland celebrates plants of the eastern North American forest. Opened in April 2012, the area is still being planted and will become more and more interesting as it matures. 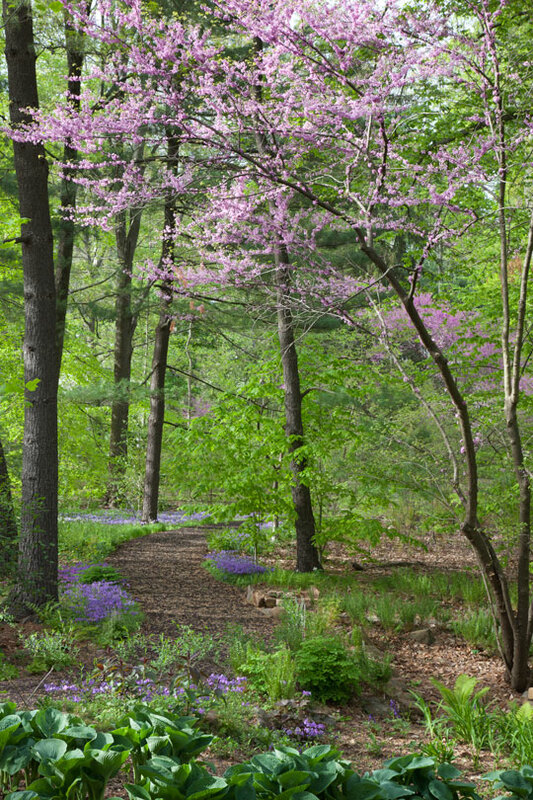 The main path wanders amidst azaleas, foam flowers, and ferns. It reuses shredded tires and is permeable to water. A smaller, stone path meanders close to Bell's Run creek and sneaks under a bridge sculpted to resemble a fallen beech tree. Here you'll find wetland plants including skunk cabbages, rushes, and sedges. The hillside flanking the Serpentine gives way to a rising meadow that features three separate bulb displays throughout the year. Spanish bluebells and fragile daffodils grace the hillside in April and begin to fade into the background as the grass begins to lengthen. The two additional bulb displays, spanning from August through October, are autumn colchicum and Lycoris, or naked ladies. These bulbs are unique because they send up foliage in the earlier months, which produces the nutrients and energy required for each bulb to bloom on a single stalk seemingly with no leaves. The maintenance and mowing of the hillside is timed around the blooming and leafing times of the bulb meadow. A semi-circle of pink, April-flowering cherries underplanted with hydrangeas and native phlox, is an old fashioned composition for an imposing house. The red gravel circle is kept deliberately unplanted, the better to balance the complexity of the architecture. To the side of the house is the sun porch fronted by a small border of sun-loving plants such as the stately bear's breeches, the purple gas plant, and a number of lavenders, including 'Grosso', probably the best cultivated variety for this area. The sun porch was originally open to the elements and for many years was the favorite room of Mrs. Rosengarten, Sr. The porch was glassed in for her comfort but was later restored as an open sitting area in 1994. The house is open to guided tours only, so the sun porch is an important link between the house and garden for those visiting without a guide. The back terrace garden, originally laid out by Thomas Sears, has undergone substantial horticultural change in the last few years. An old hemlock hedge surrounding the courtyard has been replaced with a vibrant green wall of western red cedar. A long bed of variegated Japanese grass is a dramatic counterpoint to the cool, green lawn and the rust red berries of the cockspur thorns. On the higher terrace, under the shade of an autumn flowering cherry, a table and chairs, designed and built by a member of the staff, invite you to pause. Apple espaliers and small fountains grace the walls while two beds of ever-changing silver, pink, and gray plants frame a large lawn still used for entertaining. The swimming pool has replaced the old vegetable garden and is now framed by two copper-roofed corner pieces. Tall, statuesque plants such as foxgloves in May and hollyhocks in June, add to the riotous planting in the cutting garden. The garden evokes a traditional cottage garden, especially in summer when the heat invigorates annuals, perennials and biennials. 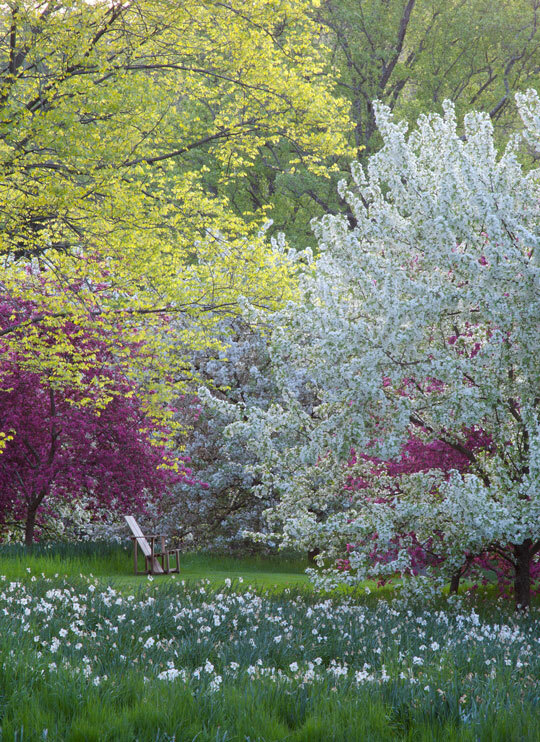 During the peak garden season, when standing at the center of the four quadrants you'll be treated to a display of hummingbirds, goldfinches, and butterflies feasting on the abundance of nectar and sunflower seeds. 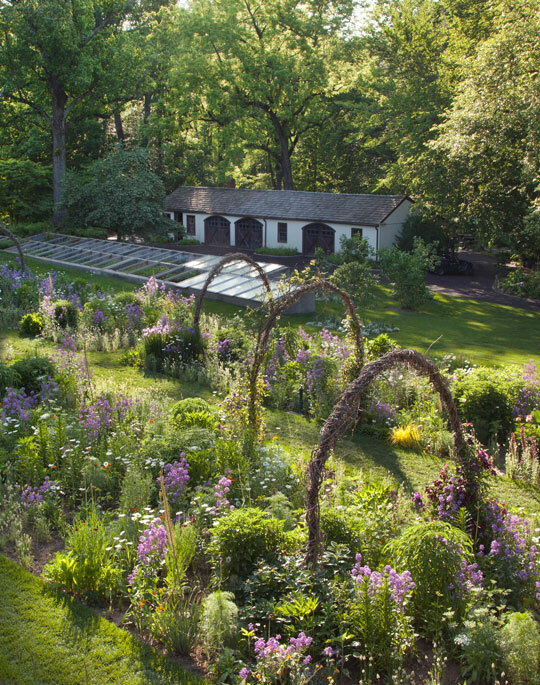 Fashioned from rebar and driftwood, a series of arches gives structure to the garden and provides the perfect place for clematis and annual vines to grow. The cold frames that line the cut flower garden are an essential part of extending the growing season and they provide a staging and growing area. Our new gently elevated walkway makes the steep slope from the Chanticleer House to the Serpentine easy to navigate and accessible to all. It features two viewing platforms and staff-made furniture of white oak grown on the property. At its highest point, it is eight feet above a blooming meadow with a grove of quaking aspens running through it. 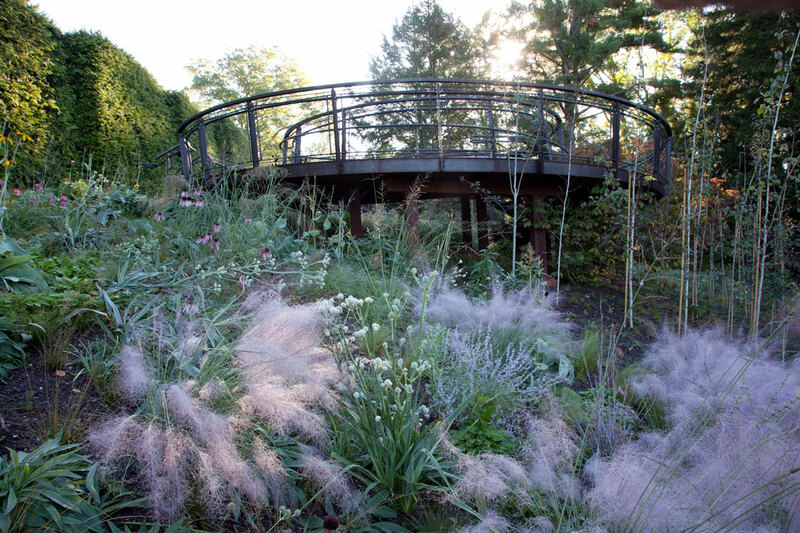 When experiencing the gravel garden, it's best to walk the syncopated series of stairs that lead down close to diminutive, unique plants. In spring the garden is graced with tulips, miniature daffodils and colorful columbines. However, early summer brings the show-stopping combination of orange butterfly weed, lavender, and Nassella (Mexican feather grass). Thyme graces nearly every nook and cranny of the garden and begins its show in May alongside the pinks and poppies. Perhaps the most unusual sight in the garden are three yuccas (Yucca rostrata). Rare in the Pennsylvania climate, this plant requires well-draining soil and thrives on heat. In addition to the myriad of small jewels scattered throughout the gravel garden, it also provides a lookout down to the Pond Garden and Serpentine. This woodland path runs between the Ruin and the great lawn below the Chanticleer House. 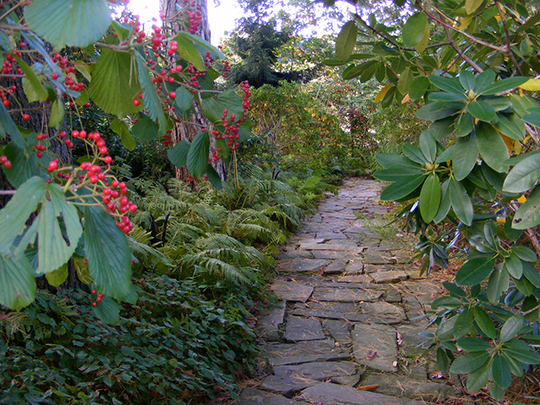 A stone walkway carves through the shade, allowing discovery of interesting plants and furniture. One year, morel mushrooms flourished at this site, inspiring a mushroom-themed sitting area, including a shelf fungus plant list box. The tree canopy consists of a towering red oak and dark green pines, firs, false cypresses, and hemlocks. Azaleas, andromedas, hellebores, and mountain laurels flower in the spring, followed by the blossoms of sorrel trees in August. Fall color ends the season, brightly contrasting with the evergreens. As you leave the Tennis Court and walk toward the main house you see on your right a long, sloping lawn, punctuated by flowering shade trees. In spring this place is glorious with daffodils - eighty thousand white or pale yellow narcissus running in two rivers to the bottom. There is an intoxicating time in April when the warm spring air carries their sweet perfume. They later fade into rivers of grass, then turn to hay that is cut in early July. The large pond was constructed in the early 1970s and remained unplanted to serve as a mirror for the trees that surrounded it. 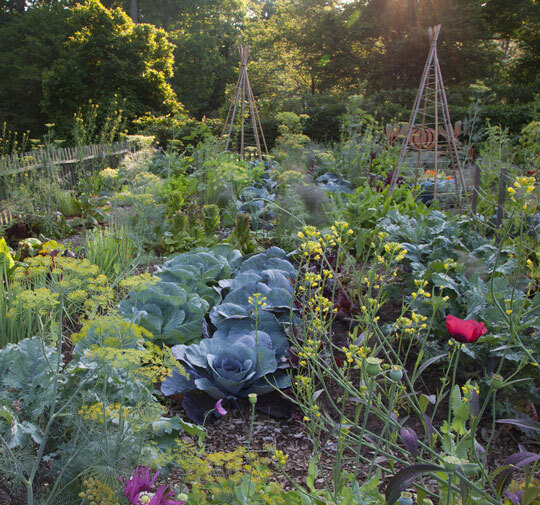 Over time, plantings edged their way, creating a dense herbaceous thicket of summer and fall flowers and fruits. Additional ponds were added in the last seven years. A considerable amount of planting has ensued and the pond area now constitutes a significant garden. There is more work to be done and we are contemplating putting a small pool between the existing ponds and the arbor. 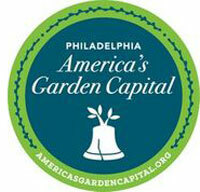 The planting is consciously coarse with ornamental grasses, daisies, iron weed, and black-eyed Susan. Little Green Herons fish for frogs, and hummingbirds use the "cotton" of the bulrushes for nesting. Damsel flies hover and the occasional water snake slides over the water-lilies. The pond is buzzing with activity when the goldfinches descend from the trees to pick seeds. Wrens nest in the gourds strung from the arbor. Minder House, built in 1925, is where Adolph Rosengarten, Jr. lived most of his life. 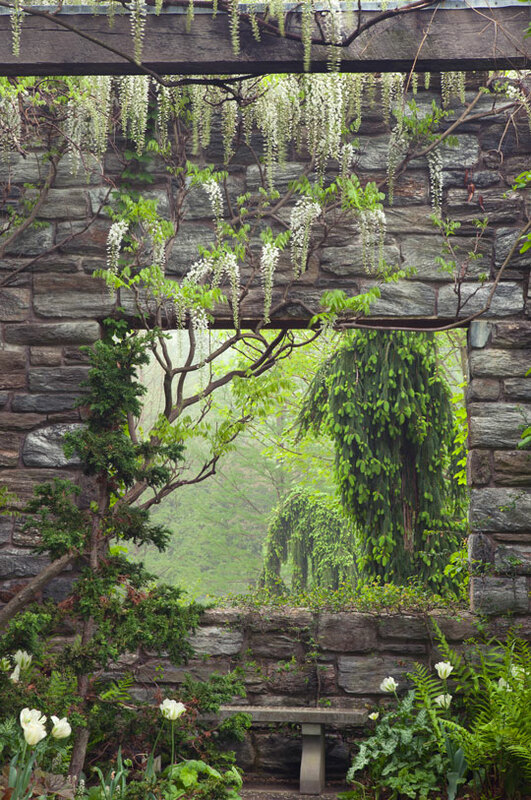 In 1999, under the vision and direction of Chanticleer's Director Chris Woods, the house was razed and construction of the Ruin Garden began. Originally the plan was to use the partially dismantled house as the ruin, but for safety reasons the only part left of the original house is the foundation and the tile "rug." With the help of landscape architect Mara Baird the new ruin was built on the foundation of Minder House where carved marble, granite and other stone pieces sculpted by Marcia Donahue define the ruin's various spaces. 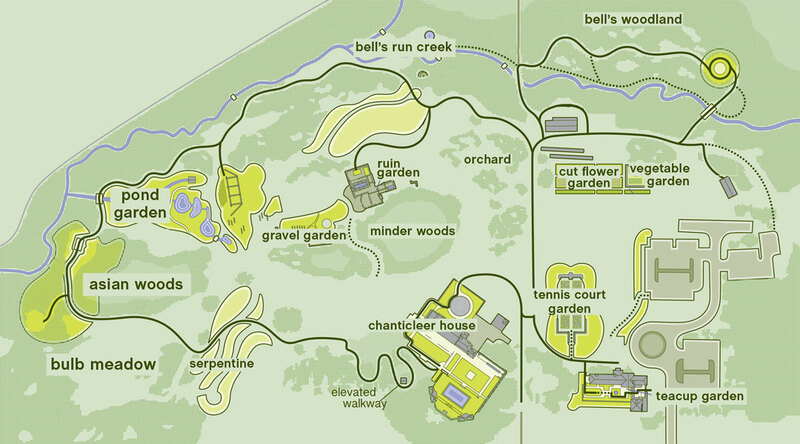 The Minder Ruin Garden was unveiled to the public in April, 2000. The Minder Ruin Garden is composed of three rooms: a "Great Hall" with a fountain shaped like a large sarcophagus that rests on a mosaic "rug" of tile, granite and slate, a "Library" where the books are sculpted of stone, and a "Pool Room, where marble faces gaze up from the depths of another fountain. It is a landscape theater. …a serpentine avenue of young junipers, banded by wheat and barley winds up to an almost pagan semi-circle backed by upright gingko trees -- a marriage of stone and wood, dedicated to Flora. The entrance courtyard, the Teacup Garden, is a seemingly chaotic opera of scents and sounds, colors and textures. 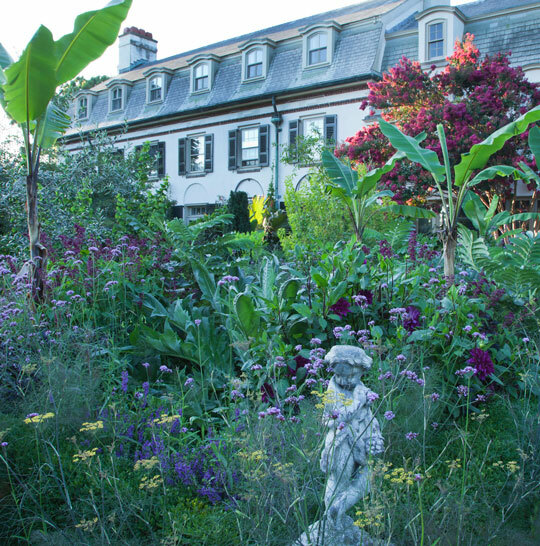 Surrounding a small, Italianate fountain, seasonally ephemeral plants, native to the subtropics and topics and well adapted to the sweating heat of the Pennsylvania summer, crowd the courtyard. Here bananas overshadow gingers, bordered by pineapple lilies. Tropical succulents with intricate detail are in danger of being overgrown by a tropical pipevine with intriguing flowers. If it seems chaotic, it is only meant to appear so. Everything is carefully orchestrated to almost overwhelm you with the diversity and beauty of these plants. Colors are carefully coordinated. Apricot devils trumpets dangle above the glowing embers of rustic orange Coleus, while maroon and burgundy foliage create a darker tone. Containers are everywhere, some with luscious tropical plants, others with more delicate finery. All through the courtyard is the sound of water and, on a summer afternoon, the sound of hummingbird wings. 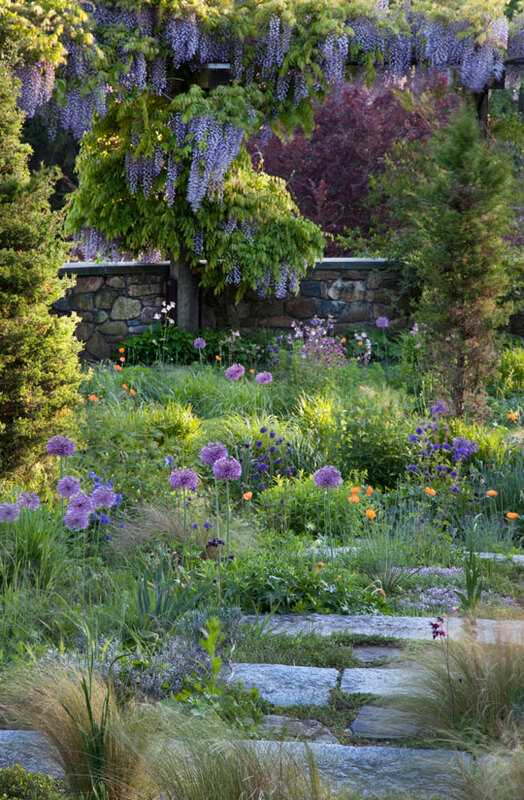 Descend to a more orderly garden with a small lawn. 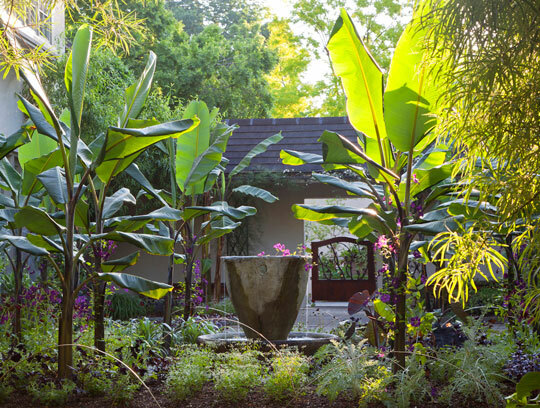 Here the tropical plants are more formally arranged, interspersed with remnants of a long gone shade garden. Immense Papyrus are underplanted with Bromeliads that anchor one border, while the rice-paper plant with large hand-shaped leaves almost pushes you off the path. Turn he corner and you may find tropical Thai beauty Caladium under the shade of an old oak tree. Once surrounded by a dense hemlock hedge, the old tennis court has been transformed into a dynamic garden. The first area to be developed after Mr. Rosengarten's death, it was orginally designed to showcase herbaceous plants for summer and fall. The original rectangle of the tennis court was divided into five beds, each with a complex but informal floral arrangement. A bank of red daylilies, now fading under the weight of shrubbery, was planted for summer color. Tall yellow flowering plants such as perennial and false sunflowers were added, making a brassy arrangement of colors. The garden has softened and changed over the years, its season extending from opening day in April to the closing of our gates at the end of October. The center bed is the most focused with a symmetrical arrangement of barberries, lamb's ears, and yuccas. 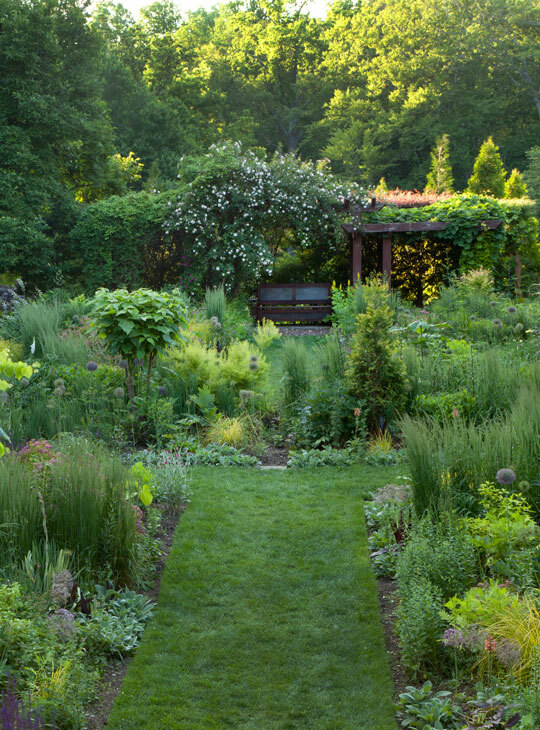 From this center, beds with subtle color themes fill the garden. An arbor covered in the rambling roses, Rosa 'Dr. W. van Fleet' and Rosa 'New Dawn', anchors one end while a grand staircase completes the other. Love-in-the-mist, an annual with fine foliage and light blue flowers, seeds under a white false indigo, itself surrounded by the tiny white daisies of the snow tansy. Poppies fill the garden in early summer and bearded irises of a dangerous hue fight with the lipstick red flowers of Weigela. 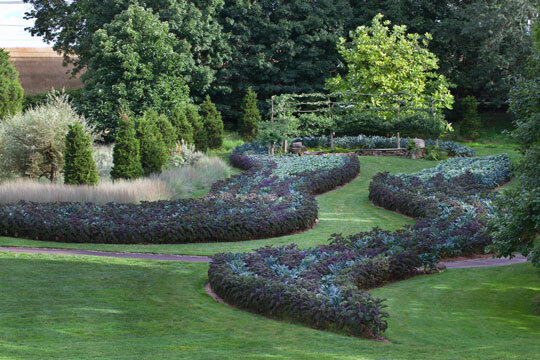 Once a huge vegetable garden, this area now pays homage to the domestic root of this former estate garden. Plants for cut flowers grow in rows. It is a simple garden, American in character, with perhaps a hint of the Midwest. A potager, enclosed by paling, contains a mix of vegetables grown for taste and ornament. A rustic fence is walled with tomatoes in summer, Serpent garlic raises its head while thyme passes. 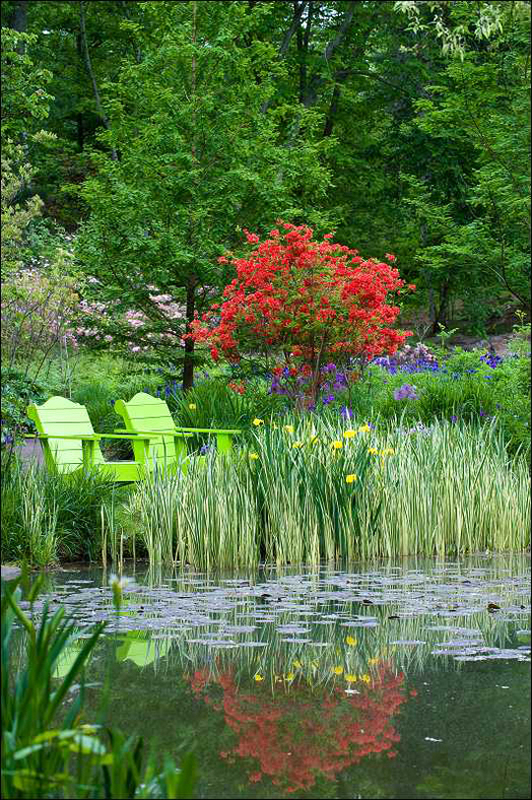 Rustic benches are well-placed under the shade of the two katsura trees.